Mirabeau, a Cognizant Company, has won a golden Dutch Interactive Award in the B2B category for process innovation. The Dutch Interactive Awards (DIA), founded by Emerce magazine and the Dutch Digital Agencies Association (DDA), are presented to the very best interactive work by Dutch agencies and are evaluated by independent jurors. Each submission is based on concept, design, user experience, results and optimization. 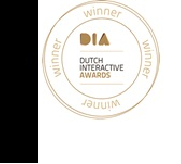 In addition to the golden DIA B2B award, KLM also received the silver DIA award for Company of the Year for its integration of digital solutions over the past year and for challenging the agency involved to take its solutions to the next level. This is the fifth DIA Award for Mirabeau, previously receiving accolades for DIA Professional in the user experience/design category, and for the Brand, Online Services and eCommerce categories.